The Notre Dame University is the owner and publisher of the Notre Dame Journal, and printed by the Notre Dame Press, located at Notre Dame Avenue, Cotabato City. The ND Journal is published annually and issued in the month of June. The Notre Dame Journal has been focusing on Mindanao Studies, particularly on the Southwestern Philippines. 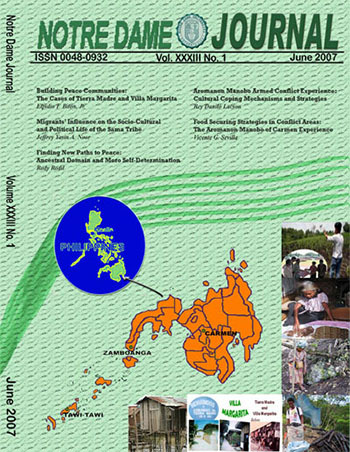 The articles published are in the areas of: governance in the Autonomous Region in Muslim Mindanao (ARMM); peace and development; and other studies that clarify issues on Moro justice system, conflict, ancestral domain, gender and development, and the socio-cultural and political life of the Moro and indigenous peoples in Mindanao. The recent articles included in the publication of the Notre Dame Journal are written by graduate students in peace and development program of the University, which cover a wide array of issues from conflict to peace building in Mindanao. These articles provide information on the issues affecting the socio-economic, political, peace and development in the Muslim region. The peace and development theories are used to explain the phenomenon of conflict, reconstruction, and rehabilitation adopted by the government and non-government interventionists in affected regions in Mindanao.